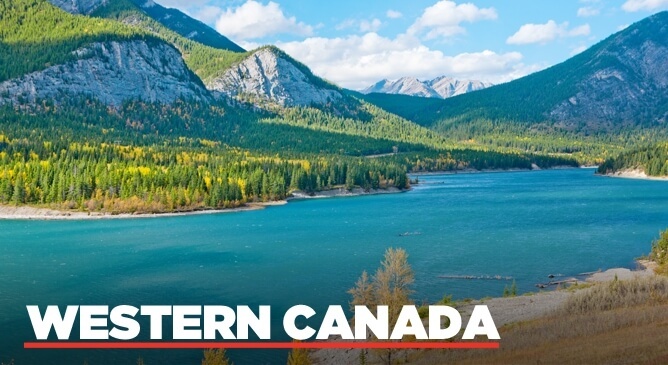 Experience the rugged beauty of the Canadian Rocky Mountains, gaze at scenic views, stroll through delightful towns and explore towering cities, all in one holiday. If you are a lover of the outdoors, a Western Canada Fly/Drive holiday is for you. On this amazing trip through Alberta and British Columbia, you will visit Calgary, Banff, Lake Louise, Jasper, Kamloops and Vancouver. Start your journey by flying into Calgary. The city of Calgary has the breathtaking Rocky Mountains as its backdrop and is located at the meeting of the Bow River and the Elbow River. With a diverse mix of restaurants, bars, museums and cultural attractions, you will have more than enough to occupy your time here. The famous Calgary Stampede is an annual rodeo that attracts thousands of visitors each year and is a must see if you are there during the Summer. The next stop on your road trip is Banff and Lake Louise, located in the heart of the Rocky Mountains. Lake Louise, known as the jewel of the Rockies, is situated in Banff National Park. Banff is Canada's oldest national park. Here you will find endless beauty after every turn you take. Outdoor activities are limitless in Banff. Get a different perspective of the mountains on a canoe or take a gondola to the top of Sulphur Mountain. If you’re feeling adventurous, take a helicopter ride to get a birds eye view. Then why not relax in some hot springs. There is something for everyone in Banff. Jasper, a mountain town, is the third stop on your trip. At Jasper, find the steep, dramatic Maligne Canyon, the calming Medicine Lake and the stunning Maligne Lake. this town is low key, welcoming and has good food and drink to enjoy. Lose yourself in one of Canada's largest national parks, where wildlife such as grizzlies, wolves and caribou literally fight for your attention, making it the perfect place to get at one with nature. Taking a hike through this park is the best way to see the natural wonders. Icefields parkway will also take your breath away. Golfing is popular in the Summer in Jasper while skiing is a great Winter activity. Blending energizing recreational opportunities with a culture of warm, welcoming people, Kamloops is an amazing place for any visitor to let loose and just play. The vast rugged landscape makes Kamloops perfect for outdoor activities. As one of Canada's more sunnier destinations, Kamloops is perfect for a game of golf or a bike ride along the rolling hills. The city of Kamloops has historical buildings and plenty of culture. This cosmopolitan city is the last stop in this fly/drive holiday. Vancouver sits between the ocean and the mountains. It has a fantastic combination of busy city life and nature. Vancouver has an amazing downtown district, a bustling port, skyscrapers mixed with clean beaches, parks and majestic mountains at the foot of the city. Swim, hike, ski, fish, cycle and much more in Vancouver. And when you have done just that you can relax and enjoy great food in the best restaurants in the area. This fly/drive is perfect for a ten day - two week holiday. If you are planning a road trip like no other, talk to Tour America today. We can help you build and plan the perfect Western Canada Fly Drive holiday. Speak to one of our travel experts today on 01-8173535.